Worldwide, the consumption of news and information is greater than ever before. But twenty years of Internet news and a decade of social media have permanently altered the patterns of behaviors associated with how consumers look for news and even how they perceive what ‘news’ is for them. As the media landscape changes and old approaches no longer fit, it may be time to re-assess the fundamental definition of “news.” Traditional news values have been defined and extensively studied by Western researchers, but little attention has been paid to the correspondence of these definitions of news with consumers’ behavior in different countries. The challenge of defining “news” is complicated by the fact that almost any event has some news value in an age of niche-news. More importantly, the process by which news is defined has changed because of a shift in the locus of power to distribute information. In traditional media, professional journalists (especially editors and publishers) have had disproportionate power to define what constituted “news.” But social media are shifting the locus that defines news from journalists to the public, with “news” becoming whatever a person chooses to share with others, and “newsworthy” being measured by the degree to which a story is shared and reshared. The most significant impact of this shift in the locus of power to define news is the potential transformation of news consumers from comparatively passive receivers of news distributed by traditional news organizations on predictable schedules to active seekers of news and information whose appetite is whetted by the morsels of information distributed through social media. This study addresses these questions with a survey of news consumers in ten countries (Canada, Chile, India, Mexico, Thailand, Russia, Ukraine, United Kingdom, United States, Venezuela). 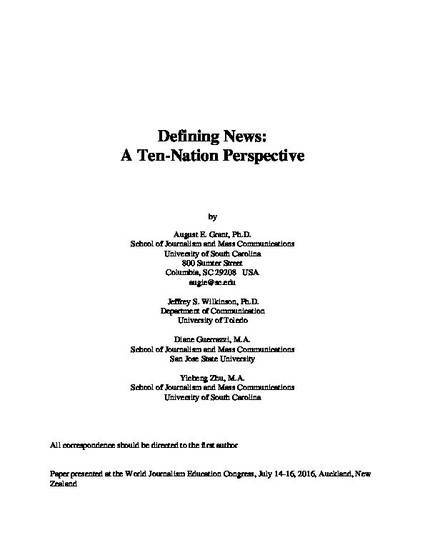 This inquiry begins with an exploration of traditional news values, then proposes a set of hypotheses designed to test the correspondence of these journalistic values with those of news consumers in general and specific groups of news consumers in the ten countries selected for this study. The analysis then compares two dimensions of news values, conceptual dimensions of newsworthiness (proximity, prominence, novelty, etc.) and self-reported consumption of specific news stories of varying global prominence. The findings of this study have the potential to impact the newsroom by steering editors toward specific content that has a stronger interest among news consumers. At a time when people depend on information technologies such as smartphones to the point of addiction, patterns of news consumption are in flux around the world. As a result, it may be necessary for scholars to re-think what values are important in the modern news age. At the heart of this inquiry is the basic question of whether there is a common set of “news values” for news consumers around the world, or whether patterns vary by country or culture. In the process, this study also addresses the fundamental question of whether news consumers have the same “news values” as journalists, or whether news consumers have a different concepts and operationalization of news.